Everyone’s job, no matter what it is, is in danger of falling into a rut. Punch in at nine, punch out at five. Go to sleep, wake up the next day and do it again. It can become a massive drag, with the routine never seeming to end. Punch in, go to your desk, try to look busy, go home, and repeat. Everyone needs a little humor to get through the work week. Check to see if your boss is coming, and then enjoy these tweets from people who are taking their job just seriously enough. 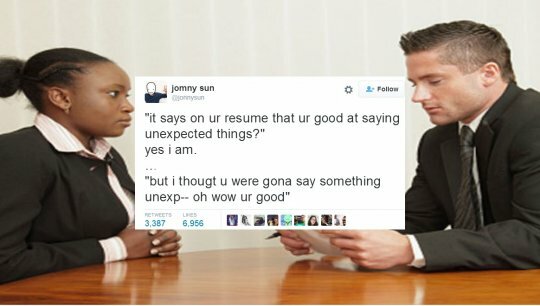 #1 - How to ace a job interview. Interviews are terribly stressing, but you can turn the table on your interviewer by staying on your toes. Don’t just answer their questions; try to stay one or two steps ahead of them, answering down blind alleys and with unexpected response. The best resume defense is a strong resume offense. #2 - There is such a thing as being over-prepared. 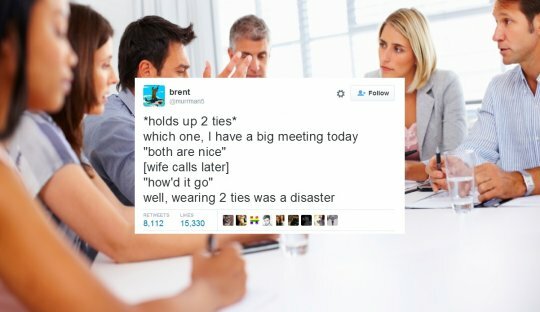 We’ve all been there—a big meeting with the higher-ups. We want nothing more than to show them how great we can be—the better to get promotions and raises. We spend hours perfecting our presentations, work to ensure that we’re on top of any possible questions that could come up, and plan our outfits to look as professional as possible. However, even the best-laid plans can go awry. #3 - Well, at least his heart is in the right place. Some jobs look really easy from the outside, but most of them involve at least some degree of special training to do properly. Don’t just assume because you’ve heard a piece of common wisdom that it actually applies in the real world. That seems to be the problem here. #4 - I’m no good at these things. Coworkers are odd sorts of people. While you may be close to some of them, others aren’t exactly what you’d call friends, yet you see them every day. That can make social situations awkward, especially if the only thing you have in common is that you work in the same place. Still, make an effort to be friendly. Even if you end up doing something awkward, it’s the thought that counts, right? #5 - Keeping things light. Is the 9-to-5 grind draining the light out of your life? Keep things fun and breezy at work with playful jokes! Maybe don’t go quite as far as this guy, however—while amusing, the story probably ends with him doing both his own work and the work of the guy he chased off. Yes, we get it. Mondays are hard. The weekend was great, but short. It’s the same every weekend, Todd. Yes, your Garfield coffee mug is hilarious. You truly are the soul of wit, pointing out that, once again, we’re all back here at work. Meanwhile, there’s an office pool just waiting to see when you’ll come up with some new material. #7 - Sometimes, the light at the end of the tunnel is an oncoming train. As the old saying goes, “find a job doing something you love, and you’ll never work a day in your life.” If only that were true—anything, when you have to do it, becomes work. You could get that fabled ice-cream tester job of your childhood dreams and end up sick of the taste of ice cream. If it was that fun to do, they wouldn’t have to pay you to do it, would they? If you do get to take a vacation, try to enjoy it. Don’t let the idea of what awaits you when you get back to work fester in the back of your mind. Oh, sure, no one is bothering to cover what you normally do, and you’re sure to come back to hundreds of emails, each one claiming to be most important to do first, but surely you can put that out of your mind for one week…right? There’s a fine art to sneaking out of work a little early, and it’s not one to be practiced by amateurs. If you’re supposed to leave at 5:00, packing up and heading towards the door at 4:30 can work if you have enough distractions and excuses. This guy, however, might be biting off more than he can chew.